tags and stats and musings. – teamgloria, inc.
tags and stats and musings. Posted on April 16, 2013 April 16, 2013 by teamgloria in people., places., things. 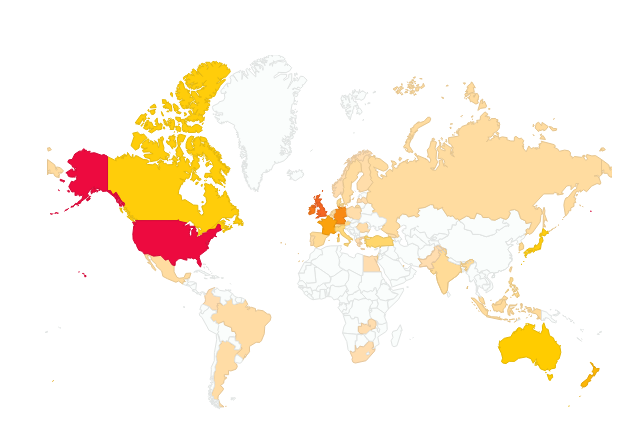 we so Rarely check the “stats” pages (we lie) on our blog and IG (instagram) but when we do (frequently) we are Tickled Pink by the sheer International nature of the delicious visitors who drop by – look! to decode a little (if we were Presenting a PowerPoint – which thankfully our new life does not require us to do anymore – we would have this point written down in the accompanying notes) – the darker areas are the most popular – hello, friends-in-the-USA, followed by the sunshine yellow – hullo, london, guten tag deutschland, bonjour paris! howdy, canada and g’day australia and a virtual hug to NZ – as well as a deep humble bow and a Konnichiwa (we are Most Excited to have an increasing number of new friends in The Land Of The Rising Sun). the peachy areas are very tentatively new acquaintances from latin america and a few – gasp – from RU (a very curious look via the interweb to you there – we never got to visit in the last Day Job, sadly). and then we took a quick gander (british for “look”) at this new-fangled area on statigram (the techie-types-that-observe-instagram) or maybe it’s been there for simply ages but we didn’t peek and it does a comparison between the most Popular Tags on instagram as a whole (see Fig. 2) and those-we-use (the exercise is to suggest one uses the tags that people-are-searching-for-on-IG-as-a-whole one assumes – but we’re not that bothered by the young Mr. Bieber – charming and apparently wayward as he is). 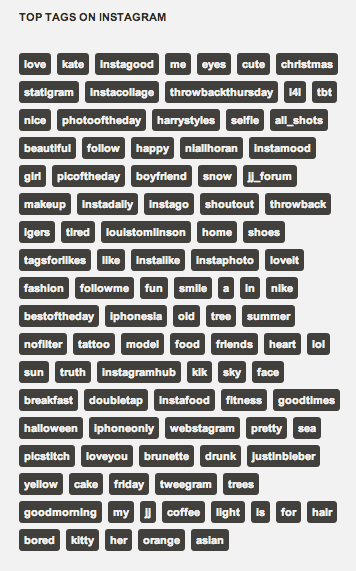 so here are our tags – and they are perfectly amusing – they couldn’t be anyone else’s tags actually. which means we are being True to ourself – At. Last. so there you have it – the strange beauty that it is the metadata behind the interweb. we remember looking behind the television set wondering if Dame Edna Everage would take us out to tea after Mr. Parkinson had finished speaking with her in front of the Nation. so there you go – the tags and stats on the interweb are a lot like looking behind the television set waiting for Dame Edna Everage to finish her show. Previous Post Annabelle gets a job (in the house on church row). Yay, a virtual hug for New Zealand. Sending one right back. you have been tagged for sure darl! we do do a Lot of Tags, tis true.